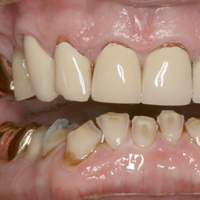 Erosive tooth wear (ETW) is a problem of increasing prevalence and severity. Patients in all age groups can be affected, including younger patients who are facing more acidic challenges due to increased soft drink and energy drink consumption, and older patients who have medically-induced xerostomia and gastric reflux (GERD). Tooth loss from erosive tooth wear is often not diagnosed and is irreversible. Therefore, early diagnosis, behavioral changes, preventive measures and early intervention using minimally invasive restorations are preferable to extensive reconstructions. During this hands-on workshop, you will learn techniques for minimally-invasive, cost-effective, long-term “no prep” treatments, including the use of composites to increase vertical dimension of occlusion. Scanning and milling digital techniques used for making long-term provisional restorations will also be demonstrated and discussed. Information will be presented regarding new and updated composite bonding techniques and materials. All participants will learn to make long-term provisionals using an enhanced silicone die and composite materials for “no-prep” fabrication of posterior restorations. New techniques will be used to produce and bond indirect posterior composites during a single patient visit. Attention will also be given to build-ups of severely worn and endodontically treated teeth. This is a “must take” course for dentists wishing to take their practices into new and exciting directions. Reference materials will be provided. Program is limited to 30 participants; includes lunch and coffee/tea service in the morning.